Bodyweight Supersets For Super Strength! Supersets aren't just for burning out your arms with dumbbells. You can use them to get the most out of big-bang calisthenics classics, too! Al Kavadlo is here to show you how. Joe Weider first introduced the concept of supersets to the strength-training community long before I even did my first pull-up. But the technique of pairing two antagonist exercises and performing them back-to-back has had a life of its own ever since, and its popularity is by no means limited to bodybuilders. All kinds of athletes use it, because all kinds of strength athletes can see it makes perfect sense! Though supersets are most commonly seen in the weight room, the same principle can easily be applied to—you guessed it!—bodyweight workouts. Just take two of your favorite calisthenics exercises and perform them back to back! What could be better? Of course, as many people have discovered, some supersets are decidedly less than super, and just leave you totally worn out after a few minutes. 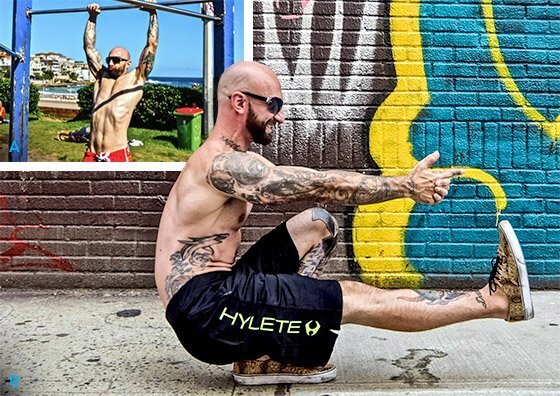 You&apos;ll need to put a little thought into your pairings to keep up the type of high-quality work we like to focus on in the progressive calisthenics community. The following pairs of bodyweight exercises go very nicely in tandem with one another, either on their own or in a solid half-hour full-body routine worth keeping in your pocket for when you don&apos;t have much time to train. Try them out and get ready to super-size your strength! The classic push/pull pairing doesn&apos;t get any better than this. I love closed-chain exercises like the push-up and bodyweight row (aka the Australian pull-up) because they engage lots of stabilizer muscles in addition to the prime movers. This means you can get a core workout without even needing to target those muscles directly. This superset will also give you a great pump, and it&apos;s easy to scale in difficulty depending on your strength level. All you need to do is raise or lower your body angle to adjust the difficulty for both of these moves. If you&apos;re a beginner, start with incline push-ups and use a relatively high bar for your rows. Advanced practitioners, on the other hand, may need to choose a harder push-up variation, such as close-grip push-ups, as well as using a lower bar for rows. Elevating your feet is another way to quickly adapt either of these moves for stronger individuals. Dips and chins, another push/pull combo, go together like bread and butter—but they&apos;re much better for getting you shredded! These two exercises complement the push-up and bodyweight-row superset very nicely, as well. In fact, you could just do variations of these four exercises for your upper body for a long time and not need much else. While beginners may have a tough time with this superset, intermediate-level trainees can do wonders for themselves by implementing this timeless combo. If you aren&apos;t able to do at least 5 clean reps of both of these exercises, you might be better off regressing them before you try supersetting them. I suggest doing self-assisted chin-ups with one foot on a bench, and dips with your hands on a bench and feet on the ground, until you build more strength. I often get asked hypothetical questions like, "If you could only do two exercises for the rest of your life, which would you choose?" Though pretend scenarios aren&apos;t typically of much interest to me, there&apos;s a very good argument for picking the muscle-up and pistol squat, should you ever find yourself in such a predicament. These two exercises alone are enough to give every single muscle in your body a thorough beating. The only catch is that you have to already be really strong to do even a single rep of either of them! If you aren&apos;t able to do a muscle-up or a pistol squat, you can try pairing self-assisted jump muscle-ups along with box pistols. I broke down the box pistol and other regressions in an earlier piece about pistol squats. These two full-body exercises complement each other very nicely, especially at the end of a training session. Though you can do dynamic versions of both these moves, I prefer utilizing them as isometric holds, as the peak contraction of each move is the most intense part. The L-sit emphasizes the abs, but also requires considerable strength in the quads, hip flexors, triceps, and chest. Furthermore, the move provides a great stretch for the hamstrings and lower back. Conversely, the bridge requires full-body strength and harmony on the opposite end of the equation. Bridging emphasizes the muscles of the posterior chain—the lower back, hamstrings, calves and glutes—while simultaneously stretching the hip flexors, abs, and thoracic spine. As they require synergy throughout the entire body, you can hit pretty much every single one of your muscles with just these two moves. That&apos;s one reason I previously included them in my list of show-off moves with practical benefits. The bridge hold/L-hold combo would also be a good choice for the hypothetical scenario in which you could choose only two exercises. Like the previous pair, the bridge hold and L-hold are both fairly advanced moves, so you may need to scale them to your level. Feel free to regress to partial bridges and bent-knee L-holds. Here&apos;s a sample workout that uses the above supersets. Feel free to scale the exercises as suggested above. It won&apos;t take more than 30 minutes, and I promise you&apos;ll feel every muscle in your body! Rest for 2 minutes and repeat. Take an additional 30 seconds between each leg if needed. Rest for 2 minutes and repeat. 4 Bodyweight Sticking Points Solved! Don&apos;t let the difficulty of advanced calisthenics movements make you believe they&apos;re out of reach. Get systematic about building your skills, and you&apos;ll have strength, athleticism, and the aesthetics to match! Looking for a mobility goal that will have immediate carryover to your workouts and your life? Start with a full, resting bodyweight squat. The benefits are incredible! Calisthenic training doesn&apos;t end with push-ups, pull-ups, and pistols. Advanced practitioners pack the Internet with showy moves that boggle the mind and set the bar ever higher. Here are 5 visual feats you should consider putting in your sights! 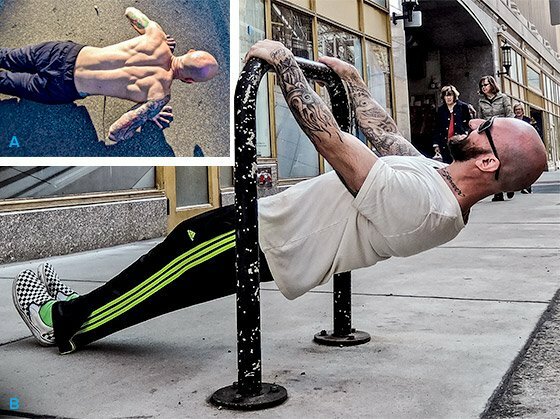 Al Kavadlo, CSCS is an expert in bodyweight strength training and calisthenics.